I sooo wanted to enter this recipe in the Beef Checkoff recipe contest because I think it stands a good chance of winning. Unfortunately, the nap I took this evening took a little too long and I didn’t post it in time. It’s ok though, I’m more interested in sharing it with you all because it’s awesome. 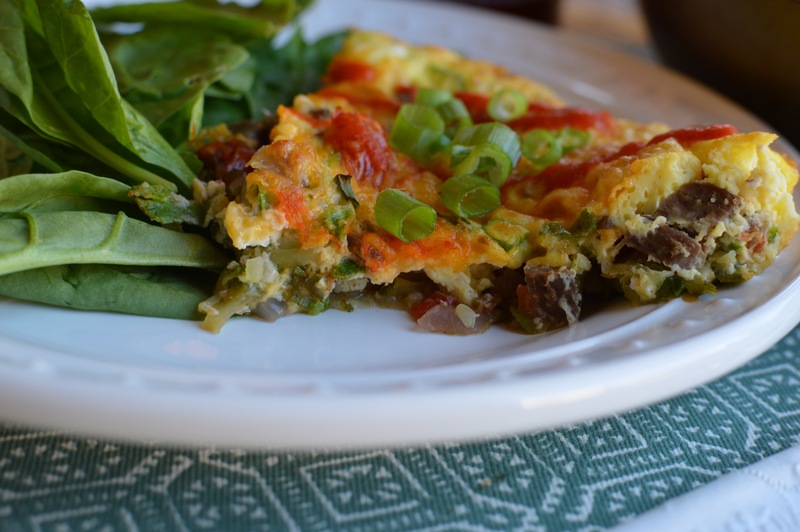 I had leftover steak from this recipe and wanted to use it to create a breakfast recipe. 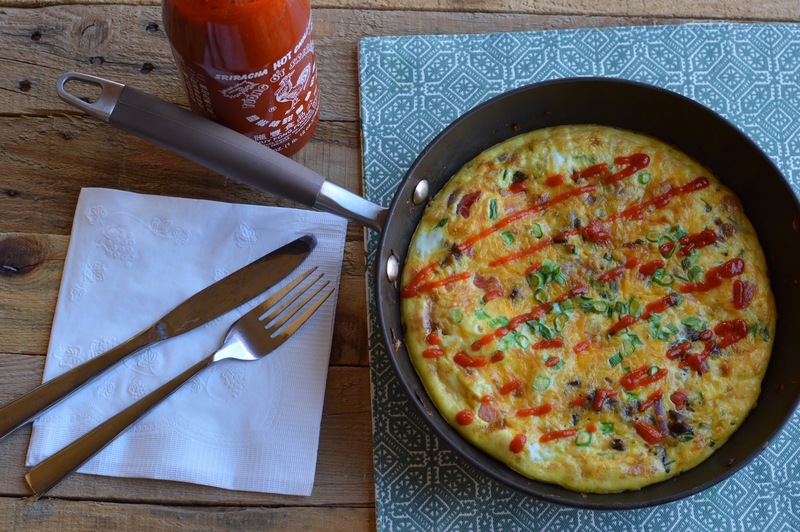 The frittata I came up with is pretty legit and takes only a few minutes to make! 1. Heat canola oil in an oven safe 10″ nonstick skillet over medium-high heat. Sauté the steak, onion, and bell pepper for about 1 minute before adding the zucchini, garlic, and soy sauce. Cook for an additional minute. Turn down the heat to low while performing the next step. 2. Whisk together the eggs and milk in a medium mixing bowl. Pour the egg mixture over the steak and vegetables. 3. Turn the heat up to medium and cook for about 3-5 minutes, or until the bottom of the frittata is set and the top is beginning to set around the edges. Sprinkle with grated cheese and green onion. 4. Transfer the skillet to the oven and broil for another 3-5 minutes, or until the top is golden and the eggs are fully set. 5. 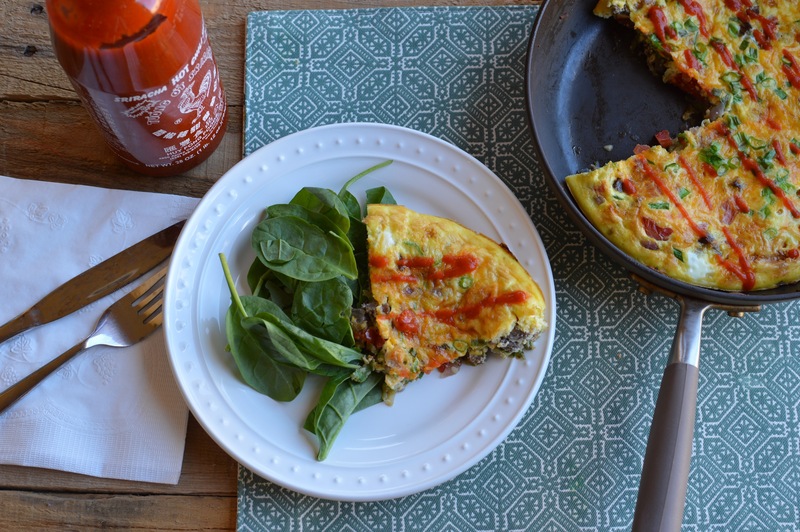 Serve immediately with sriracha sauce or allow to cool before storing in the fridge. Leftover frittatas make great salad toppers! They’re tasty cold, so there’s no need to reheat if you want to save some for the work week. If you decide to freeze this dish, let me know how it is after it defrosts. I’m pretty sure my skillet isn’t intended to be placed in the oven over 400 degrees. I’m glad the handle didn’t melt! One last thing! If you want to cut some calories from this recipe, use a lean cut of steak, such as flank or skirt steak, and swap 3 of the eggs with 6 egg whites. You probabaly won’t even taste the difference. Registered Dietitian in Las Vegas, NV. Food and fitness lover! Plan for a Cooking Demo in 10 Steps!